We know that picking the color that matches that perfect Factory Color can sometimes be tricky. That's why we would be happy to help you with researching accurate colors from the beginning. 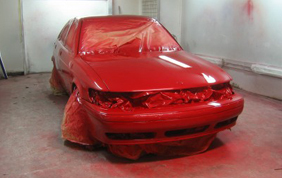 Whether you need to repair that minor fender bender or you are fully restoring a vintage auto, The Paint Guyz are here to help. We can match any OEM Color from 1900 to 2014. Just let us know what Make, Model & Year, and we'll get you the OEM Color Code. If you already have the OEM Color Code, we can match it perfectly.